On March 28, 2018, Christians and Muslims gathered at the Al Hussein Cultural Center in Amman, Jordan to celebrate the Annunciation. The driving force behind this was the Catholic Center for Studies and Media (CCSM), also located in Amman. …the message of the first Islamic Christian celebration of the "Feast of the Annunciation" in the Kingdom is to entrench values of brotherhood and to further consolidate Muslim-Christian relations in Jordan and abroad…Fr. Bader said that the ceremony…indicates that the contents of the Noble Quran and the Holy Bible are congruous with regards to the personality of Virgin Mary. Following the birth of Lord Jesus, the archangel told the shepherds, "I bring you good news". Today, on the Feast of Annunciation, Archangel Gabriel tells Virgin Mary, "Hail Mary, full of grace". This is reported in Gospel of Luke and Surat Al-Imran. It is the propitious annunciation which revealed the Advent of Lord Jesus Christ who disseminated the message of love and peace…We have gathered here today as one family to say that we support the establishment of new and distinguished relations between Muslims and Christians not only in our holy country, but rather throughout the world. Do the Christian and the Muslim understandings of the Annunciation really have so much in common that Christians and Muslims can celebrate it together "as one family"? In the sixth month the angel Gabriel was sent from God to a city of Galilee named Nazareth, to a virgin betrothed to a man whose name was Joseph, of the house of David; and the virgin's name was Mary. And he came to her and said, "Hail, full of grace, the Lord is with you." But she was greatly troubled at the saying, and considered in her mind what sort of greeting this might be. And the angel said to her, "Do not be afraid, Mary, for you have found favor with God. And behold, you will conceive in your womb and bear a son, and you shall call his name Jesus. He will be great, and will be called the Son of the Most High; and the Lord God will give to him the throne of his father David, and he will reign over the house of Jacob forever; and of his kingdom there will be no end." And Mary said to the angel, "How can this be, since I have no husband?" And the angel said to her, "The Holy Spirit will come upon you, and the power of the Most High will overshadow you; therefore the child to be born will be called holy, the Son of God…For with God nothing will be impossible." And Mary said, "Behold, I am the handmaid of the Lord; let it be to me according to your word." And the angel departed from her. The Holy Spirit prepared Mary by his grace…It was quite correct for the angel Gabriel to greet her…In Mary, the Holy Spirit fulfills the plan of the Father's loving goodness. With and through the Holy Spirit, the Virgin conceives and gives birth to the Son of God. The Solemnity of the Annunciation of the Lord celebrates the coming of the Angel Gabriel to the Virgin Mary to announce to her the special mission God had chosen for her in being the mother of His only Son…When we repeat the words of the angel by praying the Hail Mary, the word of God germinates in our soul. Christianity is this never-ending event of encounter with God made present in the maternity of the Blessed Virgin Mary. So in the Christian Annunciation, we see that the angel Gabriel came to Mary and announced that she was to bear the Son of God. And mention in the Book (the Qur'an, O Muhammad, the story of) Maryam (Mary), when she withdrew in seclusion from her family to a place facing east. She placed a screen (to screen herself) from them; then We sent to her Our Ruh [angel Jibrail (Gabriel)], and he appeared before her in the form of a man in all respects. She said: "Verily, I seek refuge with the Most Gracious (Allah) from you, if you do fear Allah." (The angel) said: "I am only a messenger from your Lord, (to announce) to you the gift of a righteous son." She said: "How can I have a son, when no man has touched me, nor am I unchaste?" He said: "So (it will be), your Lord said: ‘That is easy for me (Allah). And (We wish) to appoint him as a sign to mankind and a mercy from Us (Allah), and it is a matter (already) decreed (by Allah).'" (Remember) when the angels said: "O Maryam (Mary)! Verily, Allah gives you the glad tidings of a Word ["Be!" – and he was! i.e. ‘Isa (Jesus) the son of Maryam (Mary)] from Him, his name will be the Messiah ‘Isa (Jesus), the son of Maryam (Mary), held in honour in this world and in the Hereafter, and will be one of those who are near to Allah." "He will speak to the people, in the cradle and in manhood, and he will be one of the righteous." She said: "O my Lord! How shall I have a son when no man has touched me. [sic]" He said: "So (it will be) for Allah creates what He wills. When He has decreed something, He says to it only: "Be!" – and it is. However, this Jesus was not to be the son of Allah. After his birth this Jesus proclaimed from the cradle that he was only a prophet (Koran 19:30), and there are numerous Koran verses in which Allah states that Jesus was not his son (e.g., 4:171, 5:17, 5:72, 9:30, 19:35, and 112:3), but rather only one Messenger among others (e.g. 3:49, 4:159, 5:75, and 61:6). And, not surprisingly, Muhammad himself referred to Jesus as just another prophet. These two Annunciation stories share this in common: Mary was approached by an angel named Gabriel who told her she would bear a son sent to her by a Supreme Being. But there is a fundamental difference: with the CCSM understanding of the Annunciation, that Supreme Being is the Christian Triune God; with the Muslim understanding of the Annunciation, that Supreme Being is Allah. As I have written before, the Christian Triune God and Allah are completely different entities. This difference is emphasized when we consider who is being announced. In the Christian Annunciation story, Mary's son is the Son of God. 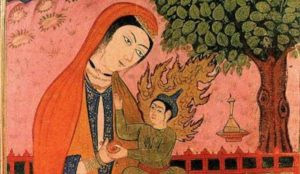 In the Muslim Annunciation story, Mary's son is just another in a line of Prophets, and her son's status as the Son of God is specifically denied by Allah in many Koran verses and by Muhammad himself. So we can see that the Christian Annunciation story is completely different from the Muslim Annunciation story in terms of the nature of the person being announced, making these two Annunciation stories mutually exclusive. Only by ignoring this fundamental, undesirable fact can Fr. Bader and other Christians laud the idea of Christians and Muslims celebrating the Annunciation together "as one family." Thus another Potemkin Village is built for the sake of "Interfaith Dialogue." Dr. Stephen M. Kirby is the author of five books about Islam. His latest book is The Lure of Fantasy Islam: Exposing the Myths and Myth Makers. "Jordanian Christians, Muslims celebrate the Feast of the Annunciation," Abouna, March 29, 2018; accessible at http://en.abouna.org/ar/holylands/jordanian-christians-muslims-celebrate-feast-annunciation. Munir Bayouk, "Fr. Bader: The celebration of Annunciation consolidates brotherhood,"Abouna, March 27, 2018; accessible at http://en.abouna.org/en/print/12738. Fr. Rif'at Bader, "Fr. Bader calls for distinguished relations between Muslims and Christians," Abouna, March 31, 2018; accessible at http://en.abouna.org/en/print/12767. Catechism of the Catholic Church (Liguori, MO: Liguori Publications, 1994), Nos. 722-723, p. 191. "The Solemnity of the Annunciation of the Lord," Abouna, March 25, 2014; accessible athttp://en.abouna.org/en/content/solemnity-annunciation-lord. These verses and the subsequent verses are from Interpretation of the Meanings of The Noble Qur'an, trans. Muhammad Muhsin Khan and Muhammad Taqi-ud-Din Al-Hilali (Riyadh, Kingdom of Saudi Arabia: Darussalam, 2007). Abu al-Fida' ‘Imad Ad-Din Isma'il bin ‘Umar bin Kathir al-Qurashi Al-Busrawi, Tafsir Ibn Kathir (Abridged), abr. Shaykh Safiur-Rahman al-Mubarakpuri, trans. Jalal Abualrub, et al. (Riyadh, Kingdom of Saudi Arabia: Darussalam, 2000), Vol. 3, p. 32. "Do We All Believe in the Same God?" FrontPage Mag, December 22, 2014; accessible at http://www.frontpagemag.com/2014/dr-stephen-m-kirby/do-we-all-believe-in-the-same-god.